Camping Les Baleines är en camping i Saint-Clément-des-Baleines, Charente-Maritime, belägen vid havet. Denna terrasscamping har platser med stängsel, med skugga, utan skugga och platser med lite skugga. Camping Les Baleines ligger i närheten av en sandstrand. Det finns möjlighet att hyra husbilar och vandrarstugor. På campingen finns en lekplats. För den sportige semestervandraren har campingen olika cykelleder. Det finns ett underhållning. I den närliggande omgivningen kan du också simma i havet. I Camping Les Baleines är det tillåtet att vindsurfa och åka vattenskidor. Denna inspektör gör varje år ett besök på Camping Les Baleines och inspekterar campingen för ca 200 faciliteter och för andra förekommande punkter. Inspektören är en medarbetare från ACSI och arbetar inte för campingen. Wij komen hier al jaren en genieten steeds weer van deze prachtige plaats. Camping ligt ideaal om te voet of per fiets de omgeving te bekijken. Zeer schoon sanitair. A lovely peaceful site with very new and spotlessly clean toilet facilities. Such kind and friendly staff who take pride in their site and go out of their way to be helpful. Pitches are a good size but very sandy so a groundsheet is useful. We hired bikes from the site and had great fun touring the local area. Easy walking/cycling to local restaurants and lovely beaches. The Ile de Re is well worth a visit and we would definitely recommend this campsite. We've been motorhoming for over two years now and have never spent more than 5 days in any one place until Les Baleines...9 nights..we just didn't want to leave. So peaceful, brilliant cycle rides through the marshes and the local villages, really friendly staff, clean toilets, big pitches...and right beside the beach. Couple in motorhome with dog. First time at this idyllic location. 1 minute walk to lovely beach, 5 minutes to the restaurants at the Phare. Bus stop (5 mins walk) to anywhere on the island. The site is sandy and care needs to be taken on some pitches to avoid getting stuck. Facilities are modern though limited out of season. Friendly helpful staff. Bread every morning also pizzas in the evening. Didn't want to leave. Will definitly return. Clearly there have been dramatic improvements since the last (English) review in 2011. Vill du boka campingen Camping Les Baleines eller få mera information? Det går bra med nedanstående uppgifter eller via campingens webbsida. 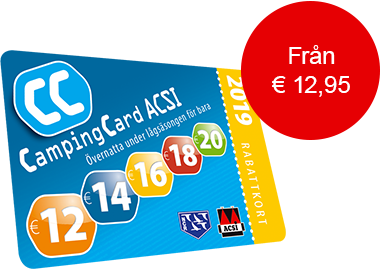 ACSI Eurocampings skickar din informationsförfrågan till "Camping Les Baleines".